Opt-in settings on ONTRAforms Smart Form blocks determine whether a user must confirm that they want to be added to your database. Single Opt-in is when a visitor fills out the form and clicks the submit button, they're added to your database and receive your emails with no further action required. 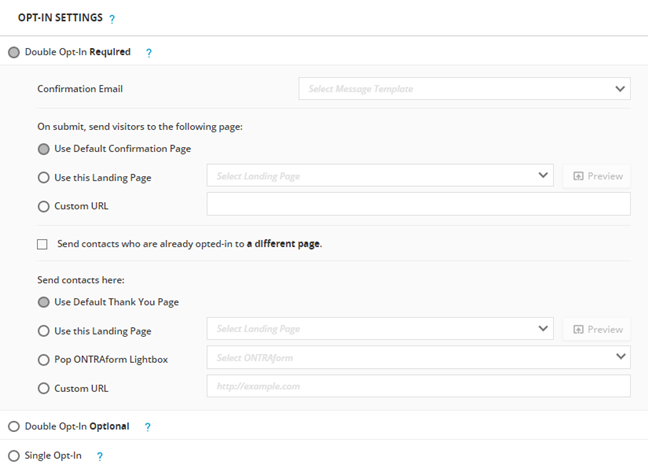 Double Opt-inrequired is when a visitor needs to confirm their sign up. They are sent a confirmation email where they must click a link to confirm their desire to receive emails from you. Double Opt-in Optional is when a visitor fills out the form and clicks the submit button, they're added to your database and receive your emails. The contact is also sent a second email to click the link in the confirmation email. Follow the setup instructions above for Double Opt-in required.